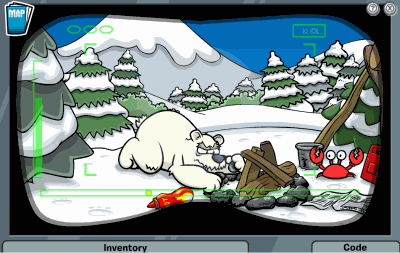 All of the mission cheats for Club Penguin are posted here. 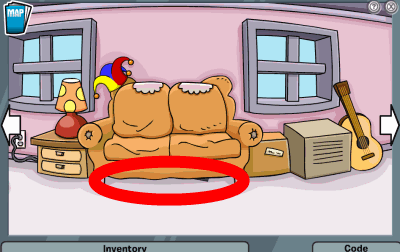 All current cheats from clubpenguincp.com. 1. 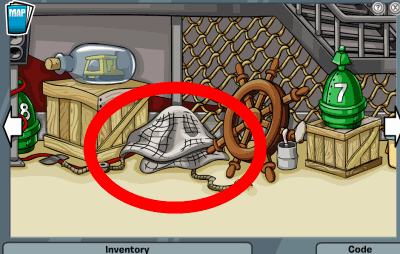 Speak to Aunt Arctic, tell her you’ll find the Puffles. 2. Go to the Ice Rink, on the right you’ll find photo’s. Pick them up. 3. Give them to Aunt Arctic. 5. Go to the Sport’s Shop and give G the number you decoded. He will give you access to his special items. Take the Preserver Launcher and go to the Iceberg. 6. 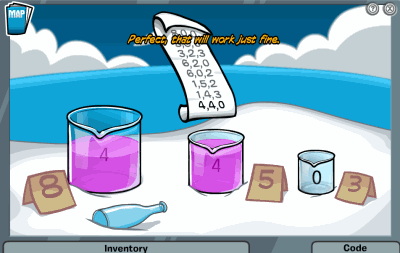 On the Iceberg, use the Preserver Launcher to save the Puffles that are stranded on another iceberg. Careful of the wind making it more difficult. 7. Go to the Mountain and speak to the crying Penguin. 8. Open your spy phone and click on the red light. 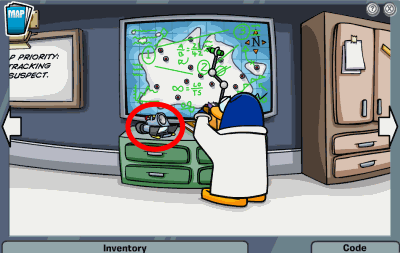 Use your spanner to fix the crying Penguin’s telescope. Look through it and look left. 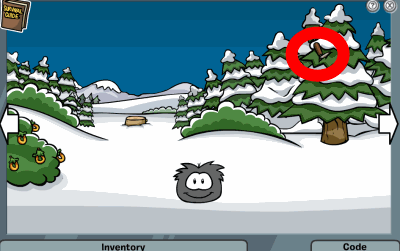 You’ll see a green puffle flying around the top of the tallest mountain. 9. Go back to G and get the grappling hook. 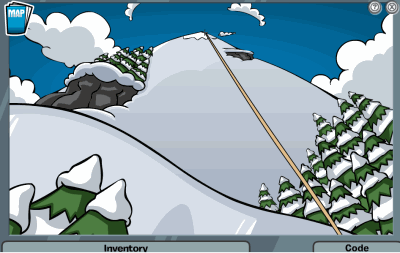 Then go to the tallest mountain and use the grappling hook to climb to the top. 10. You’ll find the penguins. 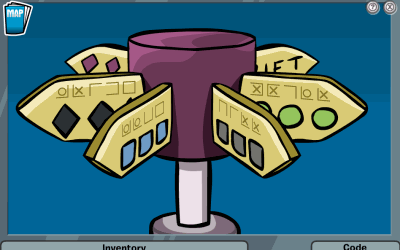 Return to Aunt Arctic and redeem your medal and a letter from Aunt Arctic thanking you for finding her Puffles. 1. Go to the Sport’s Shop and speak to G.
2. 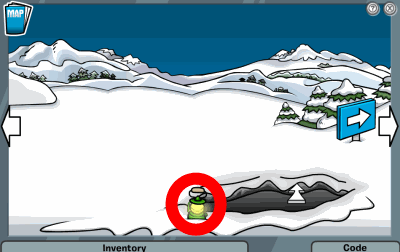 Go to the Mountain and click on the Signs, using the code on the bottom-right of the screen to decode the green sign. 3. Go back to the Sport’s Shop and give G the secret word that you decoded. G will give you access to a Sled. It is usually mogul. Take the sled. 4. 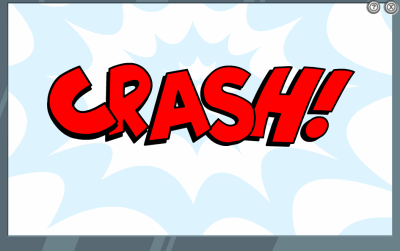 Go back to the mountain and use the sled on the Test Run, you must crash (you cannot win). 5. You’ll awake in the wilderness. Pick up the rope and Survival guide, and head to the bush. 6. At the bush, collect 3 O-berries and then head to the stump. 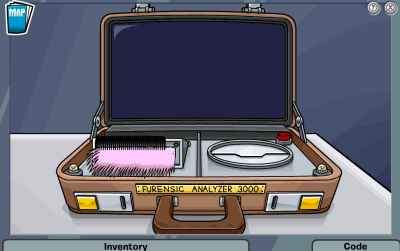 All the Puffles will run away except the black one. Feed it an O-berry and it will begin following you. 7. Go back to the O-berry bush and to the right you’ll see something in a tree. Shake in three times and a pot will fall out. Pick it up and put it into your inventory. 8. Go back to a Tree Stump. Then put your mouse over the arrow on the Left. Nowgo to the Fallen Tree and Bush. Take the Ski out of the Bush. Then take the Rope and put it on the Ski. They will form a fishing rod. Then take an “O” Berry put it on the fishing rod. The “O” Berry will become the Bait. Go back to the O-berry bush and put your mouse over the arrow on the Left. Then go to the river. 9. 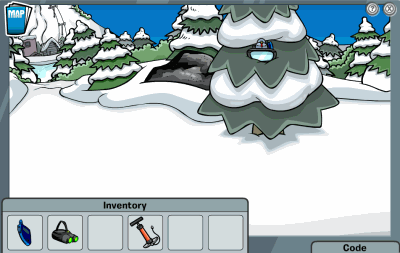 At the River, collect the log and then go far left and fill your pot with water. 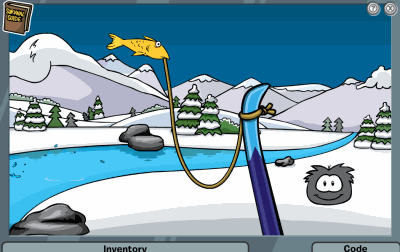 Then, attach the rope and an O-berry to your fishing rod and catch a fish. Pick the fish up. 10. 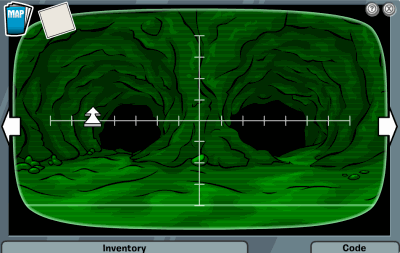 Go to the cave and push the bushes aside and enter the cave. 11. Go right and click on a rock to push them together. Put the log on it and the survival guide where the rocks are. 12. 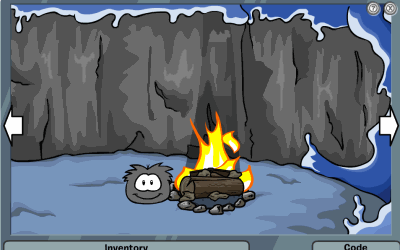 Then, feed your black puffle another O-berry and it will light the fire. Place the water on the fire and drink it. 13. Place the fish on the fire and then eat it. 14. You will fall asleep, when you awaken go outside of the Cave and you will be rescued. Redeem your medal and letter and you’re done! 1. Talk to G and ask him where the Life Preserver is. 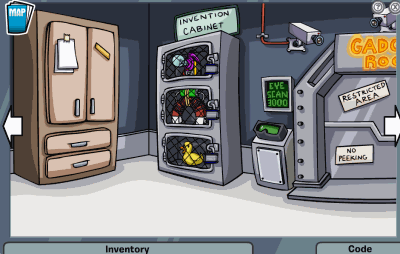 Go into the Gadget room on the left and find it. Place it in your inventory. 2. Go to the Ski Lodge, on the right you’ll find the Fishing Rod. Pick that up too. 3. Head to the Lighthouse and beside the boat you’ll find a rope. Pick it up. 4. Head to the Sportshop. 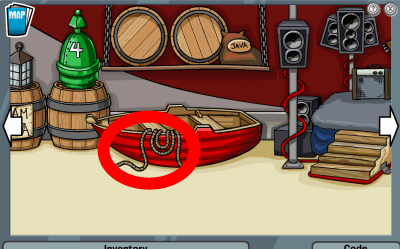 Place the rope, fishing rod, and life preserver together so that they create one item. 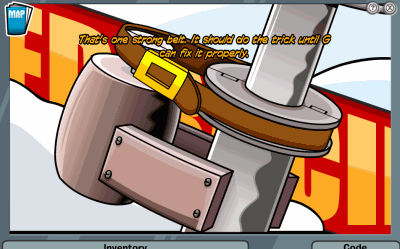 Then Pick-up the Pirate’s belt from the statue. 5. Go to the Ski Village and talk to the crying penguin beside the chair lift. He is crying because the lift is broken. 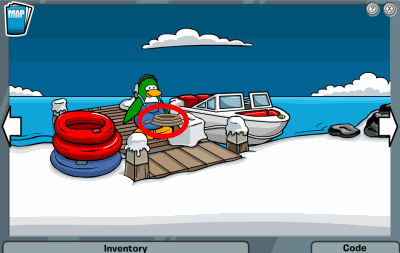 Place the pirate’s belt on the ski lift to fix it. 6. 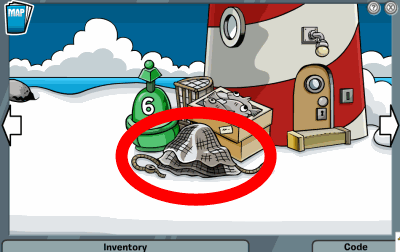 Pick up the white fur near where the brown penguin is cheering. Now go to the Lighthouse beacon. 7. Use the wrench in your spy-phone tools to remove the telescope so that you can take it with you. Place it in your inventory. 8. Go to the Sportshop and go up to G’s room. Place the telescope that you just picked up onto G’s tripod. 9. Write down the path that you have to take through the maze. Then head to the mountain and go to Ridge Run. 10. Follow the path that you have written down on Ridge Run. When you get to the bottom, you’ll see a cliff. 11. Launch the preservers at the penguins to save them. 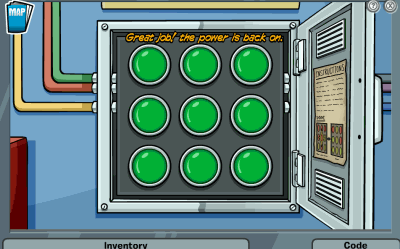 Use the first two to push the rock on the left down so that you can rescue the last one. 12. To rescue them all, first break the sticks to the right. 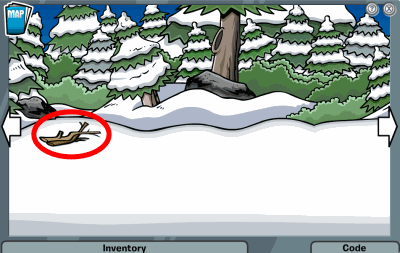 Then pick up the penguin on the middle tree. Then pick up the penguin to the right. Then pick up the penguin towards the bottom. Put them to the left and have them push the rock down. 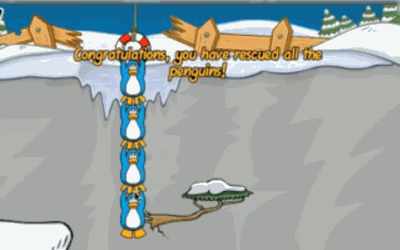 Pick all of the penguins up and get the penguin on the bottom. 13. 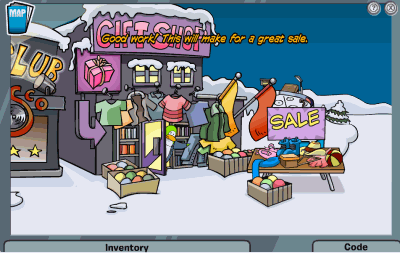 You have completed the mission, talk to G at the Sportshop and give him the fibers that you found at the Ski Village. 1. Talk to G and follow the crab up to the mountain. 2. Then fall down the mountain and follow him into the cave. 3. But you can’t get in the cave. 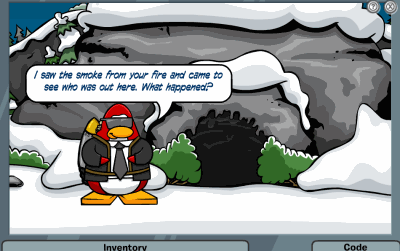 So you have to find the bag of Puffle O’s. They are by the log and the tree. 4. 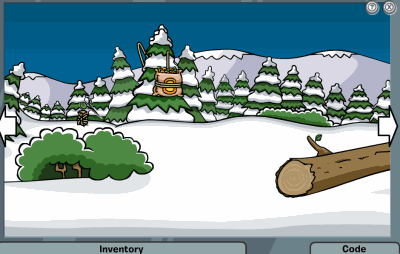 Cut down the bag of Puffle O’s and take them to the black puffle who she be by the log. He will follow you. 5. 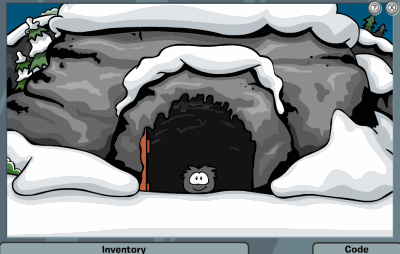 Bring the black puffle to the cave door and throw the Puffle O into the pet doorand he will open the door. 6. 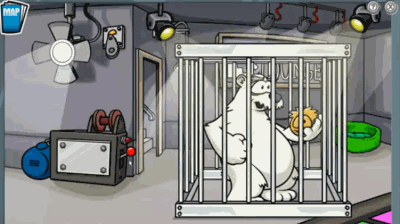 When you get in the Polar Bear will trap you and tell him a story of his adventures. 7. After that, get out a Puffle O and throw it at the lever to the side of the gate open thing (it will be a red lever). 8. 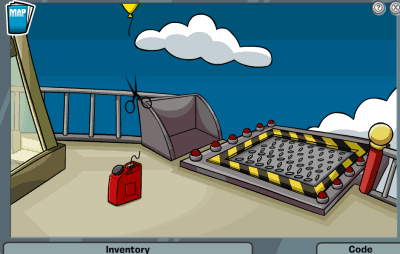 Once you do that throw another Puffle O at the top of the ramp that tilted. 9. 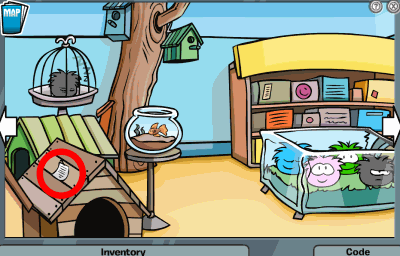 Then throw the Puffle O on the platform that is raised. Then the gate will open! After that, try to get out an the door will open but snow will fall on it that will not let you out. 10. After that collect the hot sauce, which is on the table, the rope which is on the boards, the anchor, and the diagram of his machine which is on his wall. 11. 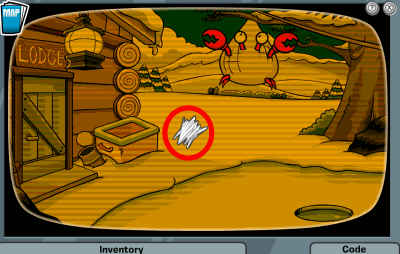 Then put the Puffle O on the hot sauce and throw it at the snow wall. 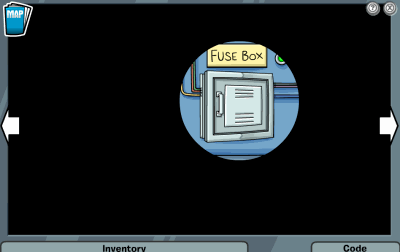 The puffle will go crazy and the wall will melt. 12. Then walk over to the wall which is one room away from the river. 13. Put the rope and the pickax together and throw it at the mountain and you will be at the top. 14. Then go to the bottom and go to the ski lodge and then go to where you go ice fishing. 15. 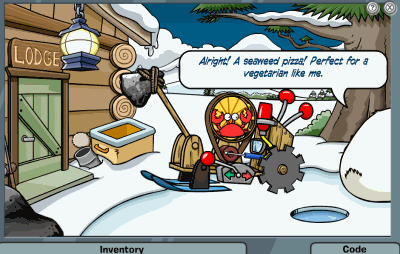 Go and get a box of seaweed pizza from the pizza shop. 16. Then you go where you are supposed to go ice fishing. 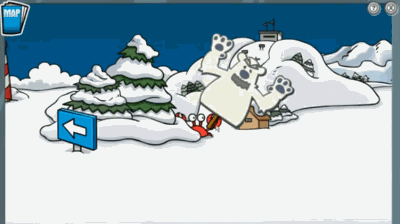 The polar bear will be there but he won’t notice you. So get out the box of pizza and click on the bear. 16. 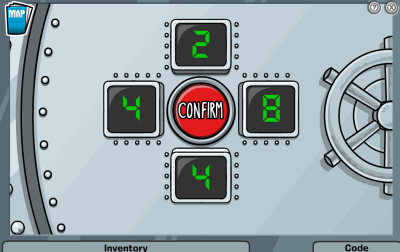 While he is occupied with that you can click the lever below the crab and it will turn to the other side. 1. Start by clicking on Gary and listening to what he says. 2. 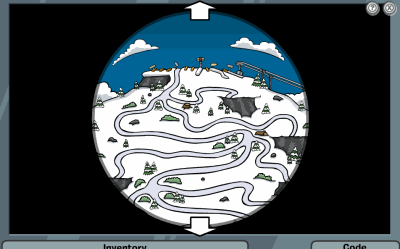 Click the screen that shows the snow forts. 3. 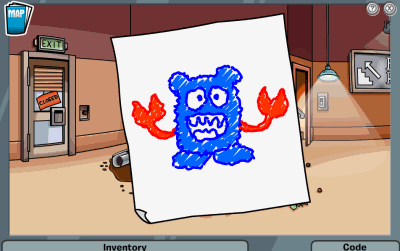 You will see Herbert and his crab breaking apart the clock. Now click out of that screen and listen to Gary again. 5. Go back to Gary and tell him you need the electromagnet 3000. Go back to the box and put in the code. 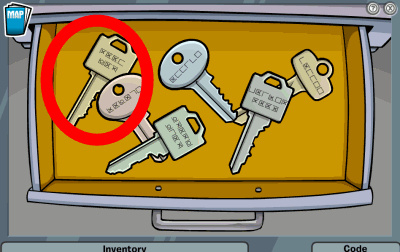 The password is key spelled in the PSA code. 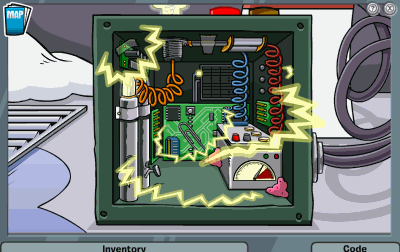 Put theelectromagnet in your inventory. 6. 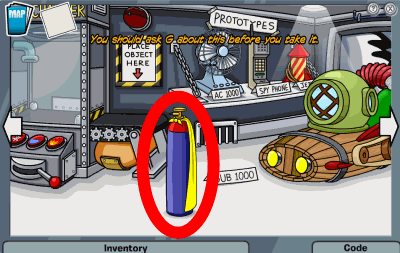 Go get the inner tube from the gadget room. 7. 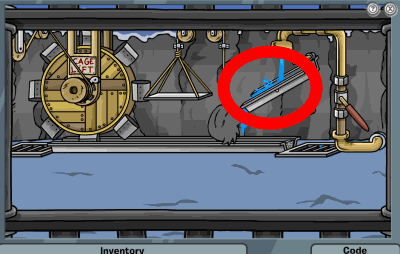 Go to the ice burg and use the magnet to get the spring in the water. 8. Now go to the beach and get the snow bucket. Fill it up with snow from the Snow Forts. 9. Go to the town and talk to the penguin with a propeller cap. 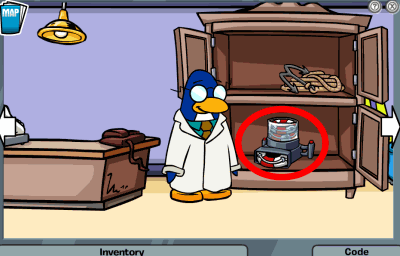 Take the picture of the gear from the penguin. 10. 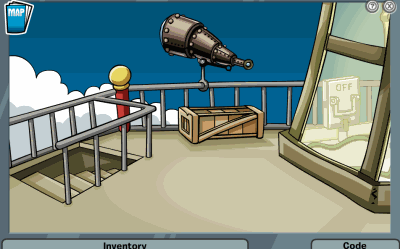 Go to the dock and talk to the two penguins. 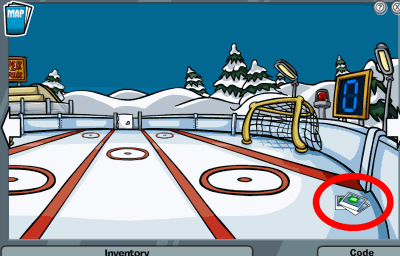 Then play the snowball game and hit the target correctly. Give them the tube as a replacement. 11. 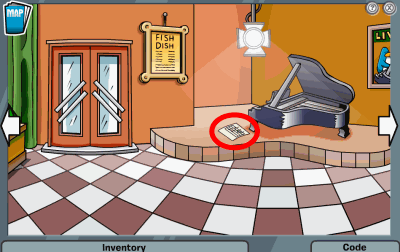 Go to the pizza parlor and receive the music sheet by the piano. 12. 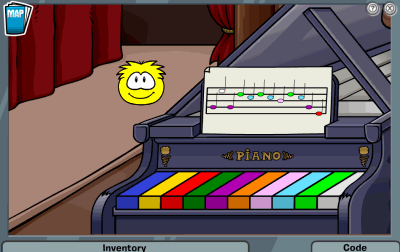 Now enter the stage and put the music notes on the piano. Play the correct notes by putting the music notes on the stand. 13. Exit the piano stand. 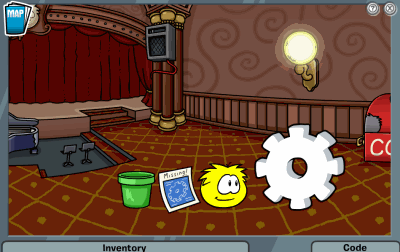 Give the puffle the picture of the gear and bucket of snow. He will make a sculpture. 14. Now take the gear to the gadget room. 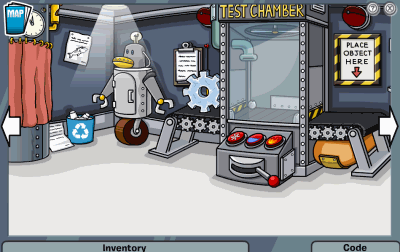 Put the snow crank on the test chamber and pull the lever. Use the snow button to freeze it. Do the same thing with the spring this time use the fire button. 15. 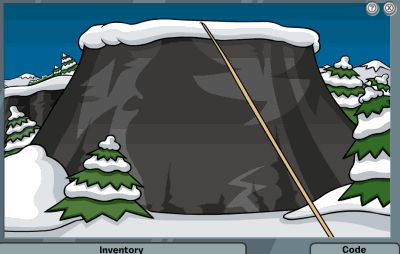 Go to the snow forts. 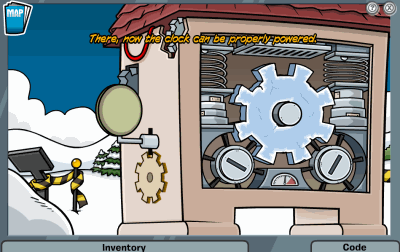 Talk to the orange penguin and put the clock back together again. 1. Talk to G. There will be a small tremor. 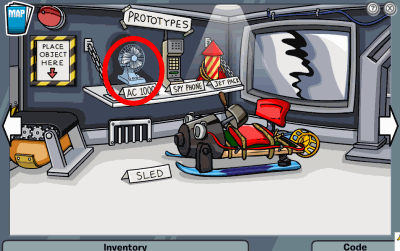 Get the propeller hat from the PSA HEADQUARTERS. Go to the dock. 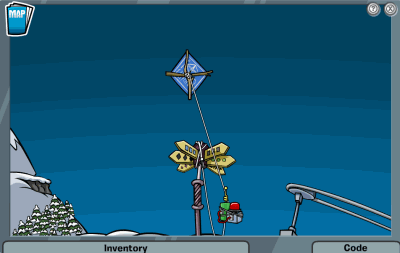 Talk to Herbert and take the lantern. 2. 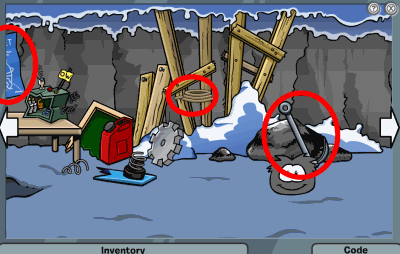 Go to the beach and pick up the fishing net then visit the gadget room and get the hammer from the wall. 3. 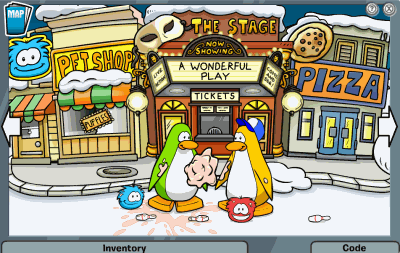 Go to the town and talk to the confused penguins. 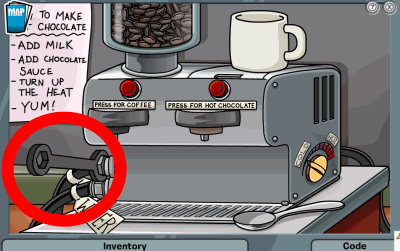 Visit the coffee shop and talk to the penguin with coffee. 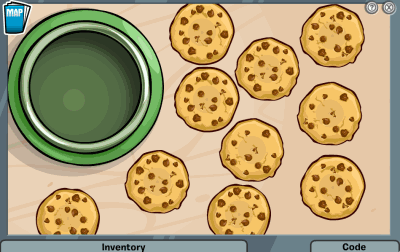 Click on the cookies and put them in the jar. 4. Take a cookie from the coffee shop employee. 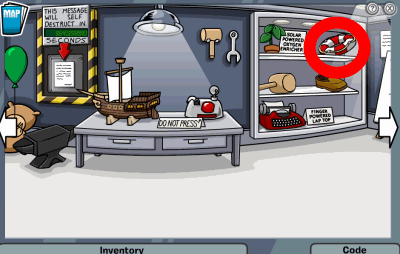 Give the green puffle a propeller hat and thfeed it to the puffle in the town. Pick up the piece of paper. 5. 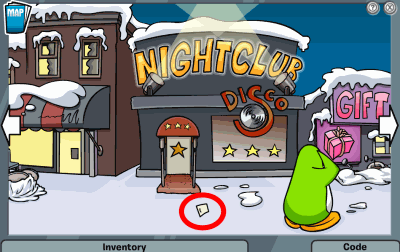 Follow the piece of paper, clicking it every time it lands. It will end up in the town. Talk to the penguin with the paper in his book. Ask to see the newspaper. 6. 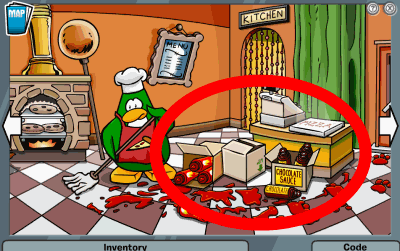 Go to the pizza shop and earn the penguin in line a pizza. 7. Ask for the newspaper when you give him the pizza. Put it in your inventory and then take it out, you will get the small piece. Put it in your inventory with the other piece of the letter. 8. Go back to Gary and talk to him. Ask for his, “Super helium”. 9. 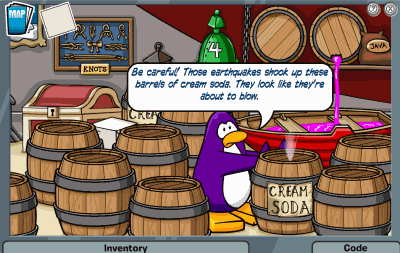 Go to the lighthouse and get the balloons and a barrel from the penguins. 10. Then, go to the sports shop and pick up the pins beside the tent. 11. Go to the tunnel at the dock and follow the directions of both sheets of paper. 12. Do the first one on the first sheet, then put on your night vision goggles to find your way. 13. 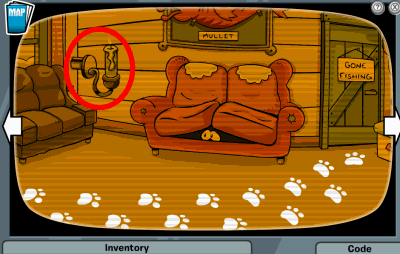 Use your spy phone to unscrew the pipe from the bottom of the gift shop. 14. Now put your balloon on the helium to air it up. Go to the town and put the balloon on the top of the gift shop. Then put the net under the floating gift shop. Now put the pegs from tents in the ground where the net is. Then hammer them in. 15. Go under the cave and through the opening. 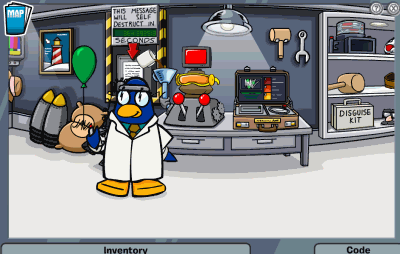 Go to the boiler room and talk to herbert. 16. 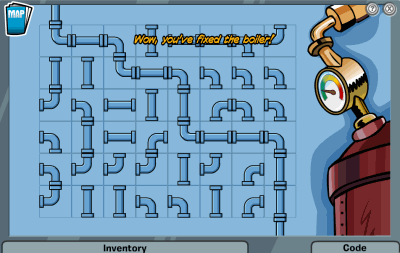 Fix the pipes to the boiler. Connect bottom right hand corner to the top left. 1. 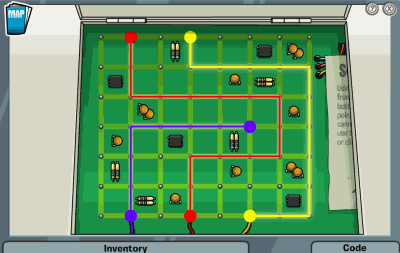 Talk to G. Then put 3 tracking devises, the yellow duck, and the blue print into your inventory. 2. 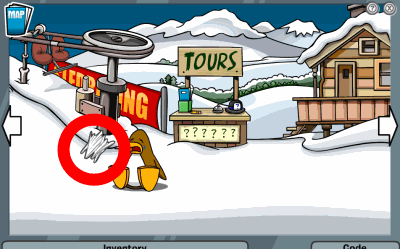 Go to the Ski Lodge and click on the two penguins playing Find Four. 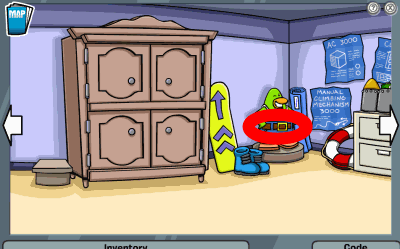 Find all of the pieces, put them into a pile, and give them to the penguins. The first is on the ladder, the second is on the small table on the right of the fire, the third is on the window sill by the entrance of the ski lodge, the fourth is upstairs by the rocking horse, the fifth is by the typewriter upstairs, the sixth is by the record player upstairs, the seventh is by the box upstairs, and the eighth is by the couch upstairs. Give them to the penguins. 3. 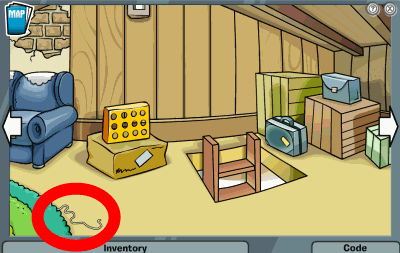 Pick up the string by the carpet in the Lodge Attic. Put it into your inventory. 4. Go to the Forrest and pick up the sticks. 5. Put the sticks, the blue print, and the string together in your inventory. 6. 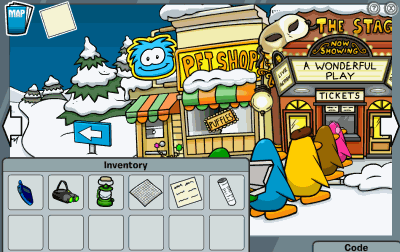 Go to the Plaza and talk to the penguins. 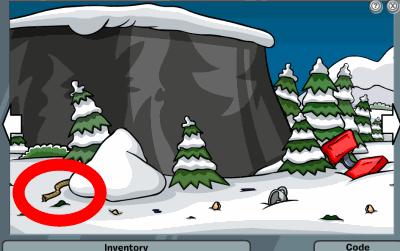 After the puffle blows a bubble, click the part stuck between the penguins. Take the bubblegum and put it into your inventory. 7. Go to the Mountain and put the kite on a transmitter. Then put it on a poll. 8. 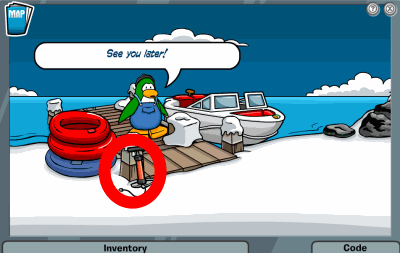 Go to the Dock and help the penguin by pulling up the brown start handle. Then borrow the penguins air pump. 9. Put the gum on the yellow duck and then put the air pump on the duck. 10. 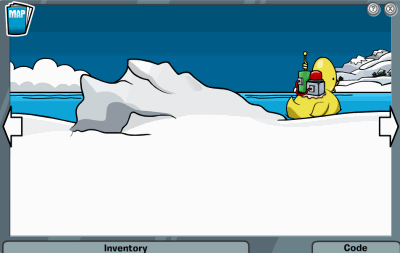 Go to the Ice Berg, and place the duck onto the water. 11. 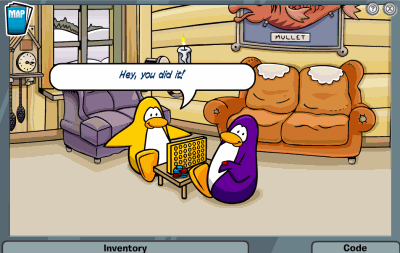 Go to the Mine Shack and talk to the penguin. 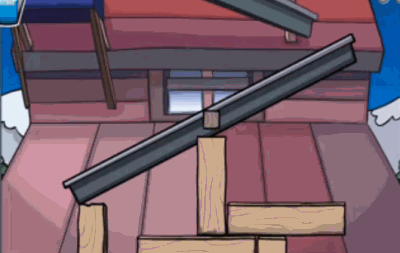 Click and drag the wooden boards, making the metal beam drop on the left side. 12. 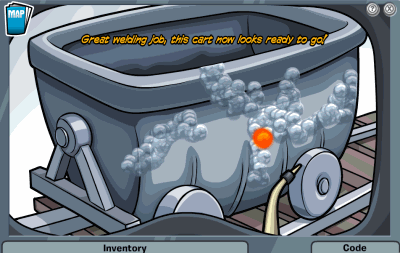 Click twice on the cart surfer cart that is tipped over and weld all the cracks. 13. 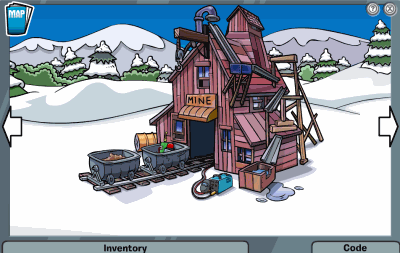 Place the transmitter into the cart and then click in the mine for the cart to go down. 14. Answer your spy phone and talk to G. Take the Binoculars 3000 from G at the PSA HEADQUARTERS. 15. 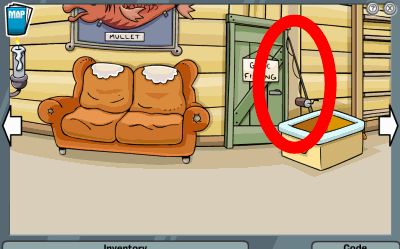 Go to the Ski Lodge, and click on the “Go Fishing” door. Look through the binoculars. Answer your spy phone. 16. 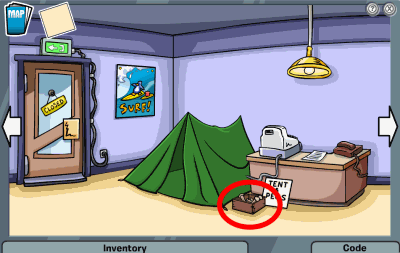 After Herbert leaves, go to his camp and look around. 17. 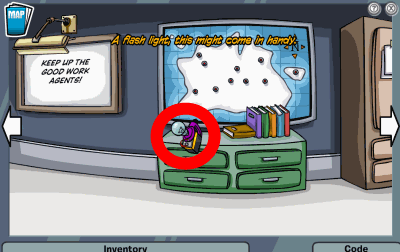 Go to the PSA HEADQUARTERS and talk to G. Go back to Herbert’s camp and place the spy phone on the binoculars into the left tree. 19. Go back to the PSA HEADQUARTERS and watch Herbert and Klutzy. 1. Talk to Gary, jetpack guy, and rookie. Take the solar panel from the box of odds and ends found in Gary’s gadgets. 2. 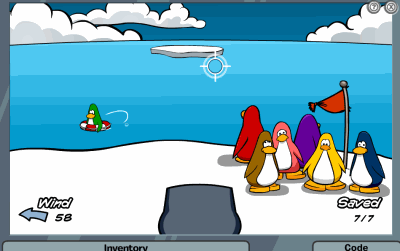 Go to the Beach and talk to the penguin with the jetpack. 3. Go into the Lighthouse. Grab the empty barrel. 4. Go back to the Beach. Talk to the penguin with the jetpack. Give him the empty barrel. 5. Follow the help message. Divide the units how it says to until you reach the end. 6. Go to the Dock. Talk to the penguin with the rope. Place the rope in your inventory. 7. Go to the Gift Shop and talk to Rookie. Place the solar panel on the wires of the magnet. Connect the wires. 8. Get the table, box of stuff, and clothes from the manager. Place them outside on the table. 9. Go to the Nightclub. Using the rope, put it on the pulley near the cage and press on the lever. 10. 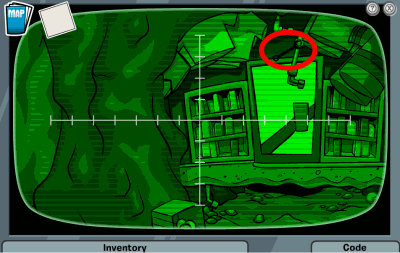 Open the box up using your wrench found in your Spy Phone. 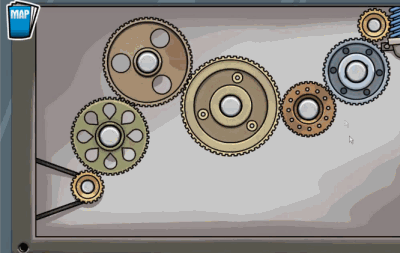 Align all the gears so that they all touch each other. 11. Go to the dock and you will meet a fake Klutzy. 12. Answer your Spy Phone again. Go to the Night Club. Pull the red lever down and capture Herbert. 13. Shine the lights on the solar panel of the magnet. 14. 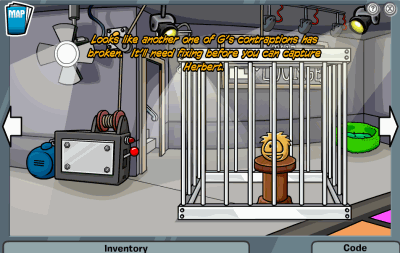 Herbert gets away. There is nothing you can do about it. You will still beat the mission. Talk to G and the mission will end. 1. Talk to Gary and tell him that you are ready to start the mission. 2. Gary will ask you about the seeds. In the language of science they are called ”Poaceae”. Gary will ask you what is the name of it but not a scientific name. First you should say ”Are those Flower Seeds?” and then answer with “Corn Seeds”. 3. Go to the Town, then to the gift shop. Talk to Rookie and pick up the other yellow corn seeds which are evidence on the floor. 4. Go upstairs and talk with the Jet Pack Guy. Pick up the yellow corn seeds under the desk. 5. Go back to the PSA HEADQUARTERS because Gary will call. Your spy phone will have a bad connection. 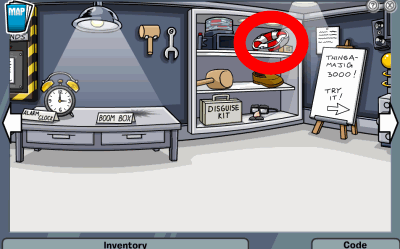 Either keep clicking or head to the headquarters by going through the Sports Shop. 6. 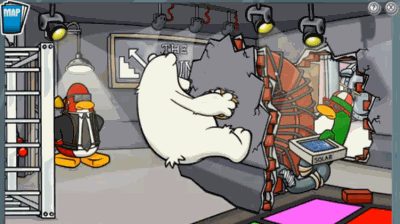 Herbert will take over the screens in Psa Headquarters. 7. Go to the Lighthouse. When you are there, you should see a CD which will be under the piano. Pick it up and use the bottle and rag to the left of it to clean the disk. 8. 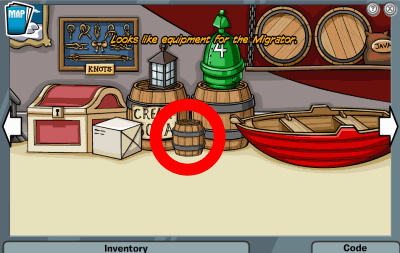 Click on the bucket and put it in your inventory. For extra credit, go to the Beach and fill the bucket up with water. 9. Go to the back room of the PSA Headquarters and put the filled bucket on theconveyor belt. 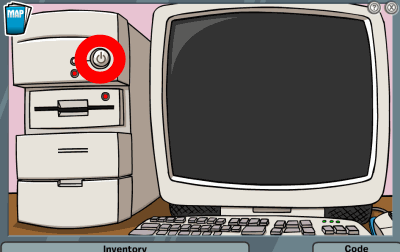 Then press the switch, then the snow icon, and finally the red switch. A round ice block will come out. 10. Go to the Beacon and give the mechanic the ice block. 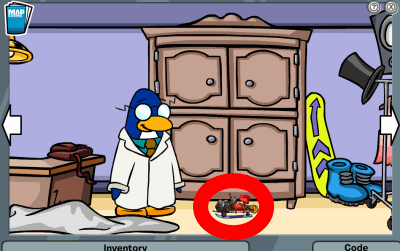 Take the lens next to the mechanic and give this to the brown penguin at the Ski Lodge. 11. Go to the Ski Village. 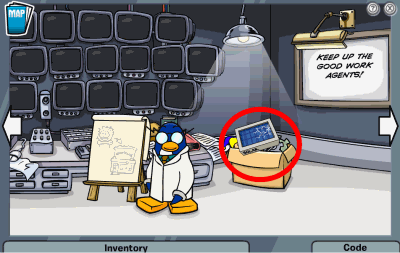 You are going to find a DVD player behind Herbert’s screen. 12. Click on the DVD Player and put the disk in it. Then Herbert’s music will play. 13. Go back to the DVD player to stop it. Use the wrench to open the electrical boxto the right. 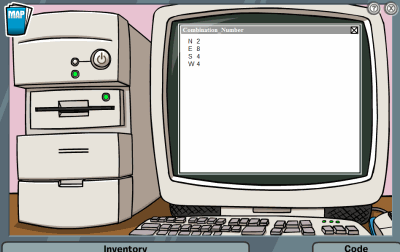 Guess the correct code for the box. The colors are not the same for everyone. 14. Go to the mine, then the corn room. Follow the steps which the popcorn on the ground leads. When doing this, pick up the four pieces of paper and the wood. 15. To complete the maze, go to the left path near the watering can, then the left near the kernels of corn, then right near the fertilizer, then left near the hot sauce, and then left near the coffee beans. 16. Herbert will be on his computer laughing. Unplug his personal computer so that he will then send you back to the Psa Headquarters. 17. Click on the orange book to the right. Click on the target, then click on the help to fill the puzzle in the right way. 18. After this, there will be a bunch of talking. You will have beaten the mission. Claim your medal and special gift. 19. 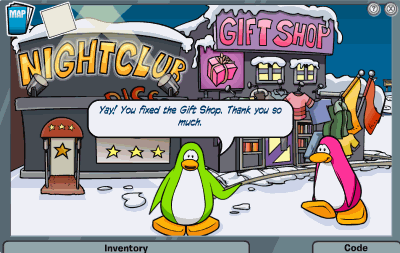 Now that the mission is done, click on the snow globe gift for helping. In this, there are a special pair of Spy Goggles. Get them by clicking on the red button on the side.